here is a link to a website with tuning instructions and longer tones. 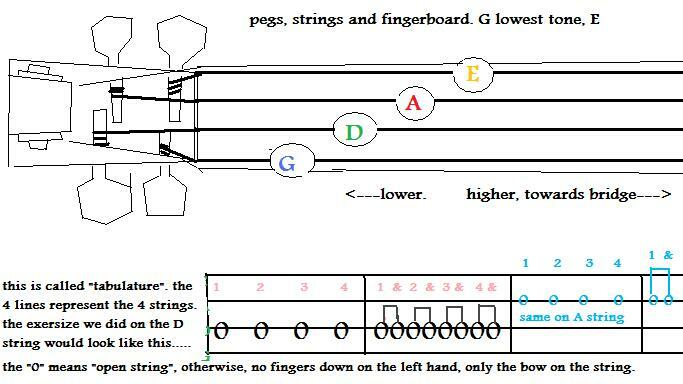 MP3s D scale G scale A scale D scale with bowing pattern. guitar backup for D scale, played slow. long rich bowstrokes. listen close and lock in to the rhythm. also do the 1 2 3 4 rhythm to this. middle 3/5ths of the bow. links, pictures, videos, how to hold the bow, different ways to approach. just suggestions, not responsible for editorial content. clicking will take you away from this page unless you right click and pick "open in new window or tab". there's a lot of good info here. we will work more on bowing and everything next week!